Profound, heartening and worthy of reflection is this piece, Charlie. We can’t do these things without Holy Spirit. May His seven gifts (wisdom, understanding, counsel, fortitude, knowledge, piety, and fear of the Lord) and twelve fruits (charity, joy, peace, patience, kindness, goodness, generosity, gentleness, faith, modesty, self-control, and chastity) be kindled anew in each of us and may we be infused with His Power. Wow, Charlie. Gonna re-read this one a few times. Much to ponder. Excellent. In these times to keep us from losing heart we must pray unceasingly and stay in a state of grace. Confession and eucharist are the primary aids. Losing heart, discouragement, depression, despair, despondency- all part of the territories of the demon of sadness and acedia. Renunciation of a pleasure helps here. I must admit I get confused and overwhelmed by all the blood moons, and over half the time I cannot see them, due to the clouds. Please correct me if I’m mistaken but I think it was recently at Medjugorge that Our Lady urged the faithful to pray for “strength of faith. This isn’t exactly off topic, because I believe we little people need inspiration to do little things that end up being very significant in God’s plan. One of my favorite people, who lived in a small house in the “projects” in Scotland, got up on a cold winter morning on January 21, 2009 ~ nearly ten years ago ~ and took six busses to Glasgow to sing a song. She had a natural God-given gift to which millions of people around the world have responded. She has honed that gift ~ while still living in her little house in the “projects,” which she bought and had renovated several years ago. We are little people serving a Mighty God! Sr. Bear, I almost didn’t watch this, but am so happy that I did! Her voice is, indeed, heavenly, but her humility brought water to my eyes. Thank you for sharing this. God bless you. Thank you, AudieMarie2014. Yes, while Susan has continued to refine her extraordinary natural singing talent, she has remained quite grounded in her ordinary Blackburn village roots. BTW, her family (and she) are Catholic, which I think contributes to her perspective about her talent. It is a gift from God, to be used for others. Todays Readings at mass and in the Divine Office are pertinent to our discussion. Mass First reading: Ecclesiasticus 11:12-30 speaks (to me) of Susan Boyle. Thanks for posting this, Sean. I knew exactly where I was when I first saw this ~ on April 15, 2009, which was four days after it aired on BGT (April 11, the Eve of Divine Mercy Sunday). That video went viral worldwide and broke many world records, as did Susan’s album sales. Ordinary people around the globe responded ~ and to this day, some of us are still trying to put into words our reaction. Within the year, many people from around the world who had experienced the indescribable reaction began holding “meet-and-greets” in our local areas or in other places. Susan, herself, has attended a number of these simple, fun-loving gatherings. Deep friendships have formed over the years. I have thought for some time that the “Susan Boyle phenomenon,” including the gathering of supporter-fans, was a precursor to the gathering of TNRS-ASOH people and others like us. Charlie’s gatherings in 2015-2016 and later have fostered the same kind of person-to-person relationships that are so typical of the Christ-life and His model for the Church. In various ways, we are called to be TOGETHER in responding to the needs of the times. Sean and Marie Ursula, I will NEVER forget the first time I heard this! Still makes me cry. BEAUTY, truth, goodness, characteristics of God. First time in quite a while I’ve had time to comment; have missed you all. We need prayer and face a challenge, but I’ll explain later. It’s not life and death, but just difficult at our age for hubbie and myself. Love you all. Another GREAT one Charlie! May I rise to the challenge. Maybe what’s going on for me now is preparation. We’ve missed you, too, Annie. Welcome back. Prayers ascending for whatever you need. Hi, Annie! Praying for you and your intentions. Love this so much. As a continued tribute to Susan Boyle, she handles the crowd’s approval of her after the song, with great humility. She doesn’t retaliate for their unkindness. They not only learned from her how to handle unkindness before one is proven, but after it too. God bless Susan Boyle for the lessons people like her teach each us all. Also love how later on, when she comes back on stage years later, she is asked afterward “Do you consider yourself a champion?” She doesn’t handle this with pride but humility when she says she is a champion for those with no voice. Prayers for many champions in this world for the many who have no voice. What a source of hope she was and is! 🙂 Wish there was a “love” button for this one! Wow. Thank you Charlie. So much to think about in your writing. Your last question is chilling. Oh Lord, please let me endure to the end … and bring many souls with me. Charlie…. Only read a few lines…. Stopped. I thought year of mercy ended on November 20, 2016…. Feast of Christ the King ….. And little Sophie’s birthday…. My grand daighter! Aplologize if I’m wrong but think that’s the date. Now to read the rest….. Looks interesting! You are correct, Anne. The Revelation 12 sign was three days after the end of the Year of Mercy. My error – I was thinking of them both at the time and conflated the two. Hmm…no really. I am sure it was Nov 20 2016…only cos of Sophie’s birthday. I’m sorry, Anne. You are completely right. I botched that one right good! I have corrected it. That’s OK Charlie…Just that Sophie waited to come on such a special day!!! Don’t take it from her,ha,ha! Over the last several weeks our parish priest has given sermons on the importance of gratitude, the power of the Sacraments and the Communion of Saints. In trying to think of a way to remember his wise words, I fell upon GPS. We can arrive at our destination of God and life with Him by using GPS. Be grateful, look for the good and don’t loose heart. Use the Power of the Sacraments. Don’t neglect them. They are food for the soul, strength for the body. Call upon the Saints. They are there to help. They wait for us to ask. They intercede on our behalf. How do we survive a year of judgement? By using GPS to find our way to God our Savior. Ooh… great acronym/mnemonic device, Kris. Thanks! Great to hear your words of wisdom! Wow… another mind stretching reflection. Thank you!! I feel flabby a bit…or perhaps even more than a bit . I am once again challenged to go further up and further in while letting go of the “life line” of expectations of what I think conversion looks like especially when it comes to family members and our priests. This past Sunday, my twin sister, yes identical relatively speaking, who is a passionate evangelical Protestant attended Mass with me. I have been sharing my experience strength and hope as a Catholic with her almost 20 years! Yes, some of the finest apologists from Tim Staples and even this week, with my strategic prompting , she spoke to Patrick Madrid live and said , Catholicism just seems “too complicated.” Patrick explained and even told her to call back anytime and he will put her in the front line and even said he would be sending her one of his many apologetic books. She appreciated his time and promised to keep an open mind. It is always God’s time and not ours even with our feeble attempts to hit our loved ones over the head with the flashlight of truth blinding their eyes in the name of Jesus. Gulp. Anywho, back to Sunday Mass. I attend a very Orthodox emphasis on VERY to the point of being so right sometimes it feels wrong and quite unloving. As we sat in the pew basking in the inspiring homily about the humility of John the Baptist and the teachings of Jesus to always be charitable towards others as this particular day to remember the day of our baptism and renew our commitment to be a people of charity and yielding to His Spirit and allow Him to increase within our battered hearts. My sister seemed attentive and even took notes and leaned over and said as we were moving into the line to reverently kneel and receive our Lord. She made the gesture and whispered, “ I will cross my arms and ask for a blessing. I smiled within and prayed silently, Lord please give her eyes to see you . We knelt down in front of the rail , (yes, we all were kneeling )and the Franciscan priest is moving from person to person people receive our JESUS.. and he came to my sister and passed over her as if she wasn’t even there! I thought surely he did not miss her . She stood up embarrassed because he didn’t give her a blessing and then I motioned her to kneel again and this time , he surely would not miss her! Not only did he not miss her , he shunned her with a glare! I witnessed it . She quickly left the church and it reminded me of the harsh rejection at times we received from our earthly father and I prayed , oh Lord this is not what I could even imagined ! My sister is seeking and she was just shot down twice ! After Mass, I could not find this priest to ask why. I soon found out that he didn’t have time to give blessings as he was the only priest distributing Holy Eucharist as we do not have Eucharistic ministers. My sister’s text to me later that day. In closing, As I was writing this comment, my hubby just returned from his monthly Knights of Columbus meeting with this magnet of truth for not only my fridge but for all our hearts. It certainly sums up the gritty moments in our lives where holy moments can sometimes be quite an unholy moment. Praying for your dear twin, Vanessa. Praying, too, for the priest. What a travesty to provoke embarrassment rather than love and welcome. This is a tricky issue. Obviously, the pastoral response would have been for the priest to bless your sister. However, as Father Z has pointed out, not only do priests have bad days, but they are not obligated to give a blessing at that time, so we should not judge the priest. Things happen for a reason, and we should instead see this as a calling by Christ to your sister to come deeper into the mystery of His love. Christ does not want her to settle for a blessing , but to give Himself fully to her through His most holy body and most sacred blood. So, I will pray for your sister, and the priest. James, my previous Parish Priest made the call in recent times (and instructed extraordinary ministers also) not to give a blessing at the time of Holy Communion because everyone already receives the final blessing at the close of Mass. Instead he said that those not receiving the Body and Blood of Christ may also approach with everyone if they wish and instead make a simple gesture of adoration towards the Blessed Sacrament. I had no problem with that. Now I see that such an instruction may need to be announced at each Mass to avoid embarrassment while reminding the faithful about due reverence. Yes, as Vanessa’s last comment implies, and as Pope Francis often decries, legalism in action has the ability to turn an otherwise holy moment into an ugly turn of circumstances. With the charitable prayers going up from this site and with the support Vanessa’s sister is receiving from those around her, her faith – at least as a passionate, evangelical Protestant – will remain intact. My take from the text Vanessa received the following day is that the ‘Catholic enquiry’ set-back seems temporary and that good can still come from this situation and that the Eucharistic Heart can still win over the open and loving heart. In other words Charlie, I can see a sign of hope, even more than a glimmer – there are so many possibilities. And if Vanessa’s sister does happen to check out your post and the comments I would say to her “Congratulations, you have a brave and beautiful heart and there is so much more in store for you at the ‘altar rail’ than that awful snub”. Yes, you simply can’t go wrong if Charity is the primary motivator in any situation. And if a person was overflowing with Charity, it certainly would show that that person had reached a level of spiritual maturity so necessary for these times… and all times. That said, every soul and every situation is different. I’ve witnessed some incredible acts of charity from the clergy that went virtually unnoticed by others. I’ve also seen some really bad examples as well, but I’m personally not in the habit of dwelling on that as it’s a drain. How much time is spent looking at ills and things to be offended by? Too much and too many limping down this road that habitually leads to a dead –– a dead end that staunches charity as well. We have to be as good at getting as giving. Paul compared the Christian to an athlete. Think of the athlete and the coach. The athlete doesn’t excel without the sacrifice, hard work, sweat and pain, and the effective coach knows that. And then, how many successful athletes (successful in the truest sense) later go on to become effective coaches? Ever see one of those massive flocks of birds in flight? So beautifully synchronized… like one big living body flowing like some wondrous aerial ballet –– without one little stray getting knocked off course. I’ve never seen one get knocked around and dropped from the sky. How is that possible? Well, we certainly don’t see this in humans… least not in our physical movements. I do think this may be ‘seen’ in our spiritual movements though, but I really think we might only see this in Heaven. Thanks Charlie for articulating the obvious . We are indeed to be a sign of hope. Without love we are nothing. BTW.. I have shared our lively discussion with my sister and she feels heartened just by the care we are showing by calling out the less than loving behavior . God bless you all for your insights and most important your prayers . Respectfully, I need to respond to your comment on the situation of Vanessa and her twin sister. Please bear with me, this is one of those moments where being a cradle Catholic is a blessing. The issue of Vanessa’s sister, a non-Catholic Christian from an ecclesial community that is not an Apostolic Church, going forth to the Communion rail to receive a blessing is a situation that did not exist 30 years ago and is a relatively new phenomena. So, some contecxt, and folks, I am sorry it is long, but I must draw it out. Before St. Pius X, most Catholics received once a year, at Easter. Nor did they approach the communion rail with the houseling cloth (there were no patens in those days) for a blessing. Protestants did not approach for Communion, because the rules that they could not receive were also drummed into them from their respective Protestant Church. A Protestant who wished to be received into communion with the Catholic Church followed the rules and did not approach the communion rail at Communion time. That was the norm right through and after Vatican II. With the increase in communicants. Mothers would often bring young infants up to the communion rail. The sheer amount of people made the old houseling cloth impractical and the paten came into use. How did priests handle infants? The practice of blessing them came into being. But, when you were old enough to stay back by yourself, you stayed in the pew. My great aunt (born 1900) talked about how they had to wait to the age of 12 (14 in some places!) to receive communion and you were actually confirmed around the age of 7 to 10. Did they approach the altar rail for a blessing? No, and neither did my parents, after they were old enough to stay alone in the pew, as they told me. After a certain age (3 or 4), I no longer went up with my mother or father when they received communion. I stayed in the pew or crying room until I received First Communion in 1976 – and I remember being upset because I could not receive Jesus. I do remember being very little and toddling next to my mother in St. Michael’s Church in Flushing in 1971 and getting a blessing from the priest at Communion time. But, the blessing of children who come with their parents to the Communions rail had become a custom by 1962 and is considered the norm by the SSPX and FSSP priests. I remember Protestants who attended mass in the late 1970s. They did not come forth to Communion rail to receive a blessing. In a parish in a small town, I remember older altar boys telling a priest – Father, “so sand so is in the church, and they are not Catholic, they should not receive.” I even did that in the early mid-1980s. I remember old Father Henry Romanowski, ordained in 1944, going out before mass to privately talk to Protestants on some occasions to make sure they did not come forward. I remember priests who would actually make sermons about that topic. Did the Protestants approach the altar to receive a blessing? No, and I never saw any adults do that, either. It was unheard of. With the collapse in confession, the rise of ushers guiding people to communion (a post Vatican II phenomena – before that they were actually a remnant of the defunct order of porters and stood by the back door in the vestibule, as well as ran the collection), everyone seemed to come to communion by the mid 1980s. More and more I heard stories of a Protestant friend/relative/visitor in a Catholic Church who was in a pew, then ushered out by the usher into the communion line by the usher, and then they went forward and received because they thought they had to, or “that what Catholic’s do.” Let me tell you, Charlie, if you were in a state of mortal sin, it was difficult to remain in the pew because EVERBODY went to receive and you could not stay in the pew – and when they came back, it was doubly difficult if they were to the left of you and you were in the center of the pew – climbing over people is difficult. And, I must include the peer pressure factor – “[e]veryone’s receiving, so you should, too!” So, to my eternal regret, I have made several sacrilegious communions that I have confessed because I was pushed into the communion line. In the late 1980s certain parishes were inviting/urging everyone, making no distinction between Catholic or non-Catholic, state of grace or not, to come forward and receive. I remember fellow Catholic students and I arguing with priests who were giving communion to non-Catholics and inviting them forward to Communion and Protestants who went forward and received. The Life Mass of the 1980s actually encouraged the blessing for those who did not receive, as well as blessing by extraordinary ministers of Holy Communion, but it was nothing official and there began to be a lot of kickback from both priests and laity on both sides of the liturgical wars. So, the American Catholic Bishops responded on November 14, 1996, by putting out Guidelines for the Reception of Communion – This was placed in the pew missalettes to remind the laity, and I remember it being trumpeted all over the place – from the pulpit, bulletins, and Catholic Newspapers. But, the Bishops deliberately avoided tackling the issue of blessing associated with the reception communion. At that same time, the mid 1990s, I began to hear of stories of priests refusing to bless children in the Communion line. Many of these situations were not handled well, but the anecdotal incidences of priests refusing to give blessings began to increase. Priests began quoting the General Instruction of the Roman Missal (the GIRM) as the basis of their refusal, and the Norm for the Distribution of Communion. I remember a learned priest talking about communion was only for communion and that this rule goes all the way back to St. Ignatius of Antioch’s Epistle to the Ephesians (at 5). This issue has not gone away since the1990s. Father Z has two great discussions of this in September 2008 and April of 2012. It was not just conservative and orthodox priests who have raised this issue, I have heard of it from liberal priests. The blog PrayTell has an excellent article from September 2015 and the answer is this – there is no hard and fast rule, it depends on the Diocese and most Diocese leave it to the discretion to the priest. The best answer is from the rcspirituality blog from April 2014, and there a Legion of Christ priest states, that because blessings at communion are not an official part of the liturgy, there is no prescribed response. In the Ukrainian Greek Catholic Church, Eparchy of Stamford, if the someone who cannot receive comes forward, the priest will actually bless the with the Eucharist. However, our priests have a rule from the Bishop – non-Catholics cannot receive communion, though Orthodox (wink, wink) can. Our priests are ordered to state this every time they see visitors in Church, and I know of Roman Catholic priests who state this regularly or put it in the bulletin every week. I know one Byzantine Catholic Church’s response was to get rid of ushers and pews, and leave chairs for the elderly, so no one felt obligated to come to communion, and this followed the Orthodox and older Roman Catholic example. So, I would not judge the priest. We do not know the custom of the parish, his diocese, his seminary training, the rules of his Bishop, the priest’s intentions, and so on. At most, the priest is guilty of not speaking about the rules and he needs to catechize on this. But, I will not call it a lack of charity, a snub, or a pharisaical moment. It might be any one of those, but I am not God and we do not have adequate information to judge justly. So, we need more prayer here for all involved. I am close to several priests and when you hear such stories from their end – unintentionally angering laity, getting calls from the Bishop, Vicar, Chancellor, etc., over some perceived slight or action – it is hard for them, especially as so few have good, healthy male company. I have had to intercede for priests to their superiors when laity have expressed anger after situations such as Vanessa reported. So let us pray for everybody involved here. Vanessa, love, hugs, and prayers to you and your sister. I understand your pain, more than I can express. However, it will work out to he greater glory and praise of God and your sister will come into full communion – we all look forward to that wonderful day! Man, that was a great statement. I appreciate that, James. Ironic that in a column where I strongly discouraged jumping the gun in judging others, I do the very thing I warned against. Certainly, I think Priests should note ahead of time their policy so there is not a hurtful misunderstanding. But there is more I should have thought of. I love you, Charlie, and everyone here. Prayers for everyone! God bless you, Charlie for your kindness and humility. I probably shared this story (it seems that’s mostly what I do here…tell stories), but this is a good place for it. 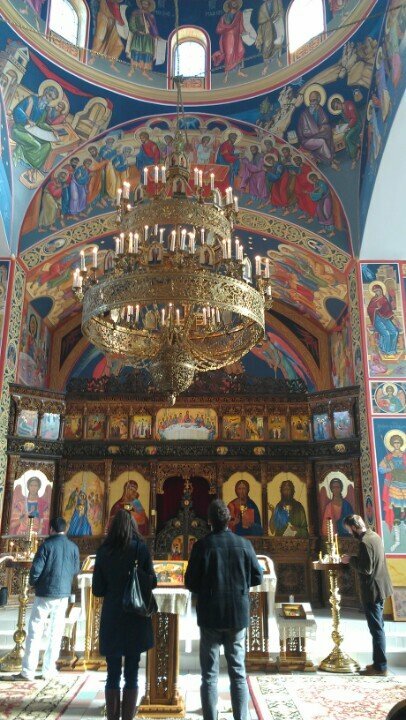 When I was in Colorado Springs, I would occasionally visit a beautiful new Orthodox Church that was just a couple blocks from my apartment. The people were welcoming to visitors, and the services were especially devout and reverent. I spoke with the priest numerous times, and he was aware I was Catholic. I felt that these people were, in every way, my brothers and sisters in Christ. I’ve since learned, but at the time was unaware, that Catholics cannot receive communion in Orthodox Churches. I assumed that despite the schism, we were in communion with each other as we believed in the Real Presence. So, while attending one Sunday service (it was truly magnificent, particularly the music) I went up to receive communion. The consecrated bread and wine – the Holy Eucharist – are given together. When it was my turn to receive, father asked me discreetly, “Are you Orthodox?” I said no. He told me gently that I could not receive and instructed me: “Reverence the cup.” He brought it toward me, and I understood that I was to kiss the beautifully ornate chalice. I did so, but was deeply saddened that I could not receive Christ and also, standing front and center, was quite embarrassed for my error. I then walked passed a plate of antidoron – the left-over bread from which Holy Communion was prepared and certain commemorations made. While antidoron is not the Body and Blood of Christ, it is blessed bread. But I didn’t touch it. Going back to my spot on the carpet, I knelt back down and just felt sad and stupid. Suddenly, I got a tap on the shoulder from one of the men I got to know at the church. Looking up, I saw he had a piece of the blessed bread for me, and he handed it to me with a kind smile. Oh, did I savor it! That was a very kind act of charity and meant so much to me at that moment. It was! And this is where it happened. I was standing right where that couple is standing. Oh, I also have a “Ding!” coming. Well said Charlie.the coldness in the situation.makes me weep.may your sister be flooded with the grace of a deep,intimate touch of Christ. We are meant to be open and loving and SPONTANEOUS like little children!!! So right though Charlie….look past the anger and shouting and you will see fear and misery. Look at our world…..screaming for Love!!! Good summary. We’re only two weeks into 2019 and it already feels like we’re going to be in rough ride, and that anything could happen. Glad to read that you’re feeling better Charlie. Hey Nancy. !….Hey Chuckie! you have an appointment at the VA in DC! Thanks Mick! but you gotta know, I stole it from another wannabe comic! Mick, Thank you and all who “liked” the joke and had a good laugh! Y’all made my day with your laughter and gave a wonderful lift to my sagging spirit in the dark night of this Great Storm we are suffering. Thanks to Charlie, Beckita, Brothers and Sisters on ASOH, the impossible burden of carrying the world on my shoulders has lifted so that with the grace of God, I am able to be more calm and peaceful in the confrontation with, and emotionally detached from, the increasing fury and violence of evil which threatens to consume the world. May God be merciful to me and hear my poor prayers to bless each and everyone with His Peace, Joy and Love in the Sacred Heart of Jesus and the Immaculate Heart of Our Blessed Mother Mary. PS: Warning! Don’t let your guard down, I intend to repeat all the jokes I have stolen from the Pros and Wannabe comics! Joseph, please be advised that I shall be ever vigilant, lest the jokes that you’ve ‘jacked and the puns that you’ve purloined catch me unawares. Here is an article with an angle I did not think of… automatic Reduction in force i.e. Non essential Federal Employees laid off. Interestingly, most of the roadblocks and hinderances to the administration have disappeared, as related within one of the articles links. What has occurred to me is “the wall” makes a very effective distraction to the anti-God left; while they putting most of their effort into stopping “the wall”, their campaign of terror & sin against the people is slowed down if not on pause. Perhaps Trump’s purpose isn’t to stop & defeat the anti-God left, but to waist their time & slow them down until God’s chosen hour has come. Well, well, well. This sheds light on that fast one the Dems tried to pull in the House with an attempted vote to end the shut down. It was a desperate move — and they just showed their hand again. And boy, am I grinning from ear-to-ear about Trump denying Pelosi her overseas trip, throwing her political words about the State of the Union back in her face. They are no match for him. Al, and perhaps we need to pray for an ingenious Brexit Plan too – and by Monday! Something that the Lord and everyone else will find acceptable. Has anybody – anywhere in the world – got any inspiration? I believe, as many others do across the nations that WITH the Lord anything is possible. Can we not take the hint? I know, it’s so laughably simple isn’t it (Be as little children…!) As it has been said here before, we are so complex (and as MP says above – so messy!). When you can focus and separate the acts & thoughts of pride vs those of humility, then all becomes clear. When we omit & remove God from our lives, we live in error, sin, & can do no good. Amen, Karen. Come Holy Spirit into e.v.e.r.y.t.h.i.n.g. and descend upon e.v.e.r.y.o.n.e., anointing hearts, minds and souls. I just have to say that a number of quite extraordinary things have happened in the first days of 2019 that made me think the other day, that this will be a Year of Reckoning. I know more than ever before that I must remain in a state of grace. Your final sentence brought to mind my brother George who died 11 years ago after a life of service to his fellows in AA. He had honored me by asking me to take him through his steps of recovery. About 1500 people helped by him in their own steps towards sobriety attended his funeral. George was neither academic nor learned. But he knew what mattered. He endured in his own sobriety one day at a time for 30 years until his death at the age of 50. By the time of his death he had three pubs and one hotel. Knowing he was dying I flew to Scotland to see him one more time. He had some pain but was full of peace and confident in the mercy and justice of God. He said “I am going to heaven.” He thanked me for giving him his life back and said he would always be with me. I knew what he meant. And today a patient returned from many years ago and moved me deeply by telling me I had saved her life having been the only professional who identified her fatal condition and referred her to the right care. I did not know this until today. I felt very grateful and humble. One of the many things I learned from George’s Fellowship is that “anonymity is the spirit of sacrifice.” Their daily plan involved doing someone a good turn and not being found out. Our Faith was not always the way with George but he died in the Grace of God fortified by the last sacraments – just like my friend Luke who is finding his prolonged death hard to take – not because of his pain – although he accepts that gracefully as penance – but because he is so impatient for God. This delay is his purgatory. It is said that the greatest pain suffered by the Holy Souls is separation from God. Sorry I can’t remember the source but once in first year undergraduate study of philosophy it was suggested that I should ask “What question is Life asking me?” Not what is life asking of me. Makes think of the question Jesus asked Peter, “Who do you say I am.” This was a question from Life Himself. I am so busy that I cannot do the extensive in depth research so rightly dear to your endeavours Charlie so I do not expect my opinions to carry any weight with you. But I hope they help someone. Like George, however, I know what matters. Pope Francis is my fellow. I am not blind to the corruption, abuse and cover up that has plagued our Church for so long. Despite the so called evidence I believe with all my heart that Pope Francis is a good man and is doing his best under extremely difficult circumstances. I trust his silences. I believe he knows the exact date of the Great Miracle prophesied at Garabandal and which has been known to the Vatican since 1969. We also know that The Warning which will halt the period of Tribulation under Communist revival, will take place in an even year. That means 2020 at the earliest followed by The Great Miracle in April of the same year. But they could be later in the life of Pope Francis. The Warning may be brutal for some but for all it will be a final chance to benefit from God’s mercy. We will be called on to help our fellows endure not only the immediate aftermath of The Warning itself but in the chance of conversion it will bring to each and every human being. Without that persistance and endurance will come the Great Chastisement. And in that we will know God’s anger. So that is what matters; conversion. And in The Warning our conversion will involve both teaching and education. The teaching will impart knowledge and the education will bring out the best in us and potentially bring us closer to God. ( The root of education is ‘e’ meaning from and ‘ducare’ to draw/lead out.) But the choice will still be ours. I am convinced I see Pope Francis through the eyes of God and I see him through by praying for him every day. Not by the furthest stretch of my imagination could I think I am seeing Pope Francis through the eyes of Satan. The upper case ‘S’ shows a healthy ‘fear’ and we are told to fear the one who can destroy both body and soul in hell. Satan does not want us to have this fear. He wants us to think of him as a pal. No fear of that from me. Thank you, Joe, for a spirited but gracious defense of Pope Francis. I follow the evidence, which is deeply disheartening, but I pray you are right and that he surprises me and all at some point. Joecro thanks for your insight on Garabandal. I’ve been there and sense what will take place but have no clue when. In my little pea brain I can relate the Warning and Rescue fitting together. That said maybe a worldwide Warning will come soon. I sure see a necessity for a warning as mankind slips further away from our Lord. Charlie, I appreciate this thought provoking site. The Next Right Step is right on and when I step wrong A Sign Of Hope helps bring me back on course. I’m extremely grateful to all contributors. Conchita tells us that the Warning will be seen and felt externally and internally as a sign, a grace or a punishment according to the state of our souls at the time it happens. Even those who are living good lives will find it difficult. For many it will feel almost unbearable. As you say our sins are always before us as is the evil we have done in the sight of Our Lord. I am sure your response is a great way to prepare for The Warning but The Warning is not primarily about the revelation of our sins. It is about an education of our offence. We will be shown in detail for instance how theft and lies differ in how they offend and hurt God. We will be shown why sin is sin. No longer will the explanation “because its in the bible” be sufficient understanding. It will be an intensely personal and private education in which we are told that only a short “time” will be bearable. It will happen outside our normal experience of time to accomodate its completion. It will seem like time has stood still. It will be experienced by every human being at the same time no matter what they are doing. Most of us will be utterly devastated but not destroyed. It is not designed or intended to harm but some may even die of shock at what they are shown. This is why we must be a sign of hope to help humanity back on its feet and face the future after it happens. We must endure and help others to endure. Its purpose is to draw us closer to God and prepare us for the Great Miracle of conversion that will follow shortly after. Without the Warning it is highly unlikely that this conversion will last and that the Great Chastisement will be avoided. Even with The Warning fallen humanity may choose to revert to kind and once again indulge its sinful inclinations. I hope this helps clarify the nature and purpose of The Warning. The Great Miracle is for the conversion of the world to the Roman Catholic Faith. Once more the Church will be one. How that will be accomplished remains to be seen. But the period of peace prophesied at Fatima may follow the Miracle. After the Chastisement, if it happens, the living will envy the dead so bad will be conditions as the world recovers. It will spare no one and come directly from God. Of course those who die in a state of grace will still go to heaven. People will return to God and peace will reign. We do not know how much time we will be given after the Miracle for the authenticity of conversion to be tested. Onset of Tribulation will be sudden and unexpected and at its worst heaven will intervene with The Warning. Mary of Agreda relates an experience which I think may be similar to what we will experience during the Warning. “….mThis light goes before me, directing my ways (Wis. 8, 16) and I took possession of it unerringly, and I desired to communicate it without envy, nor have I concealed its excellence. It is a participation of the Divinity and its presence is a great delight and joy. It teaches great things freely and it disciplines the heart; with irresistible force it banishes and expels the deceitful things of this world, wherein, solely by looking upon them in this light, the spirit finds immeasurable bitterness. By it the soul leaves behind the perishable things and flies to the sacred refuge of eternal truths. It enters into the cellar of fermented wine (Cant. 2, 4) where the Most High orders in me most holy charity. And by it He urges me to be patient and without envy (I Cor. 13, 4), to be kind without offense, to be free from pride and ambition or anger, thinking ill of nobody and suffering and tolerating all things. Its voice is ever within me (Prov. 8, 1) and secretly warns me powerfully to do what is most holy and most pure, teaching me in all things; and if I fall short in the slightest degree, it reprehends me without ever passing over the smallest point. Joe, your comment about the worst pain in purgatory is spot on. That separation is why I do not want live to 90, because the longer I am in this body, the longer I am delayed from God. Of course, I’ll go when the good Lord calls. Simply…Wow😄He who will be saved is he who endures to the end. Endure this year of judgment – and you will bring many with you. Wow…I was just reading some thoughts from Fr. Edwin Keel, a Marist priest. What Charlie wrote about seeing our fellow sojourners through the eyes of God and not through the eyes of Satan was what he wrote about. We live in a world where we dehumanize and demonize each other. It is easier to tear each other down than build each other up. We need to be peacemakers and tell the truth while at the same time showing God’s love and mercy. Vanessa, your sister is spot on in this statement. A priest actually receives a special anointing when giving his sermon which gives power to his words and grace to those who hear it so the great sermon was actually God’s sermon, so God would not be impressed. As for this priest’s ‘personal’ walk, he seems like he needs to practice what he preaches. Your sister was given a double whammy there. She heard the word of God and accepted it in her heart and then was given an opportunity to experience the rejection He feels from those who “say” they love Him. But she was tested herself and given an opportunity to ‘be’ the giver of love dispite the rejection she feels which Jesus does for us every time. Jesus, I believe (faith). Help my unbelief. (Lack of faith). Amen. Amen. Thank you Charlie! Ha, Susan…I thought about incorporating some of your latest piece from Veil of Veronica into this – but decided I would probably be forcing it, so would mention it in a later piece. Your latest piece caused me to think, “Exactly…that’s what I’m saying!” Bravo! I agree with Charlie! Susan your latest piece has me thinking in all kinds of ways I had never contemplated. Reading it was a life changer for me. And Charlie, your piece complemented Susan’s piece perfectly. Bravo and thank you to both of you. You two help bring me back to the narrow path. I have a tendency to wander off way too often….. I concur Beth. It is uncanny how the two articles released at roughly the same time tie into each other. This is certainly not the first time either that I have noticed this. The December 2nd Medjugorje Message is also calling us to do the same!! It is surely a great time to be alive. There are few things more coveted than freedom. People die for it. People pray for it. People strive for it. True freedom comes from knowing truth. Knowing truth only comes by living in obedience to Jesus. Truth is not something you merely think about or believe. Truth is something you do, you live. Jesus’ teaching always ends with the exclamation: Blessed are you who do these things! Only by doing will we ever know the truth that liberates us. There was a shift in the spirit at the start of the year that I cannot explain. If we are transitioning from a year of truth to a year of judgment, then the shift I perceived and have seen in people would make sense. Some have made an irrevocable choice and are living that out now. With God’s help, we can still reach those who have not made the final choice in the spirit. Charlie’s point is very good — we simply do not know what is overwhelming and influencing people we interact with. Life has becoming stressful, over busy, overloaded — people are having trouble coping. Hopefully we are peaceful in the midst of it all! The other thought I had was that with all of the information coming out about the failures of our institutions, God is trying to get us to not rely on worldly institutions but rather to rely completely on Him. He is a good and loving Father. Every hair on our head is numbered. Not even a sparrow falls to the ground without His will. Have faith! He has us covered. Definitely a shift since the beginning of the year. The pile-ups are coming quickly one right after another. Whew! Much to take in. Thank you, all you faith filled people here at ASOH for your insight, pearls of wisdom and compassion. The Spirit of God moves through these posts. Especially today, I thank you, Venessa, for your words have awaken in me a truth that I have been ‘right in a wrong way’ toward someone very dear to my heart. I have failed to recognize the fear and misery of a soul, failed to love without judging. Truth is truth and is best served in humble kindness. Christ be my light. Help, Lord, I have work to do for the conversion of my soul. All Knowing God, in Your mercy, forgive our sinfulness, heal our brokenness, renew our hearts to love, that we be one in You – forever. Amen. Venessa, I pray your sister’s heart remain open to the healing of Truth. As for infallability I would think John Paul 2 statement that the church has no authority to ordain women as Priests comes close. He did speak to the whole church and made it binding on all Bishops?? Charlie- I appreciated your reference to the “x” made by the paths of the 2017 and 2024 solar eclipses. You are probably already aware of this but almost at the center of that “x” sits the National Shrine of the Miraculous Medal in Perryville, MO, which was my mom’s hometown and where I spent a couple weeks nearly every summer growing up, visiting my grandparents. It is a beautiful shrine and like you I do not believe in mere coincidences when it comes to God’s design. Homilies (different Priest, different town church) from yesterday and today spoke of evangelization. Yesterday, my Pastor gave a quick story of one child evangalizing another. Asked why a youth became an Altar server: An Altar girl needed help and asked her friend to help out. Since the friend knew the Altar girls Father is a Deacon, she fugured she was in good hands. That encounter was four years ago and the girl figured she’d continue to ‘just show up’. The Pastor then recommended everyone reach out and ask someone to join them in Church, prayer etc. Theresa, I didn’t know that the Shrine would be at the center of the “x”; thanks for the information. My family and I were blessed to visit there in 2004; it was so beautiful! I have always had a love for the Vincentians, because the started and until 1992 ran the parish where I went to elementary school; and I have always had a deep love for the Miraculous Medal because of the Vincentians… even during my “wandering years” when I was away from the Sacraments. Most of us know this, that is of the moral rot of our public school system. The satan has slowly over time infiltrated our school system and I do believe this is a major cause of the increasing corruption in our society. As the Marxists used to say “Get the youth first”. So the rot has now fully corrupted vast segments of our society, and, apart from God’s mercy I see little hope for any real improvement. What a lovely story, Bob! Thank you for sharing it. I just shared it with my youngest son, and he thought it was pretty cool. Interestingly, the latest message from Luz de Maria points to…’somethings up’. I BLESS ALL THE MEN OF GOOD WILL, WHO LIVE IN THE DIVINE WILL. Beloved children, My Immaculate Heart beats for each of My children, those who every moment dedicate it to grow in love for God and neighbor, with the hope of giving God the Earth in the state in which he gave it to man . HUMANITY WILL LIVE PURIFICATION WITHIN WHICH IT WILL BE STRONGLY TESTED FOR EVIL, it will tempt you as never before, it will lead you to cruel instants trying to deny that you are a child of God. The struggle of evil will reach its end in order to take My children to escape the pain of that cruel moment, offering them to be marked (*) to obtain the benefits of those who will possess whatever is necessary so that they may live without needing anything. BEING ACTION WITHIN MY SON’S LOVE IS GROWING SPIRITUALLY AND SURRENDER WITHOUT RESERVATIONS TO THE DIVINE WILL. THE TESTIMONY IS FULFILLED IN WORKING AND ACTING AS GOD SENDS IT, THIS IS FULFILLED BY THOSE WHO COHERENTLY LIVE DETERMINED TO BE DISCIPLES OF MY SON. Man alone can not give what he does not have, can not pretend to be authentic without having first grown in the spirit, without having been formed and strengthened in faith. The human creature needs to feel the strength, the security, the firmness, the unsurpassed love of the Sacrosanct Trinity towards the Disciples of the last times, to be filled with the same faith and thus the fears, the horrors and the persecutions of this moment and the they will not bow down to you. My children, the nations will be involved in great revolts and endless revolutions, men will not know where to go and then they will be more confused, the strength of men will emerge who, with modern and encouraging ideas within the mundane, will want to fill the void interior with the extreme modernisms that are not Divine Will and My children will go from country to country in search of what they will not find. THE EMANATION OF THE ERUPTIONS OF A SUPER VOLCANO WILL FORM A CLOUD OF GASES THAT WILL PREVENT THE SUN FROM PENETRATING IN THE EARTH AND THIS WILL CAUSE A GREENHOUSE EFFECT: THE TEMPERATURES WILL LOWER SO THAT IN THE TROPICAL COUNTRIES THE COLD WILL CAUSE A NUMBER OF DEATHS. THE TRANSFER FROM ONE COUNTRY TO ANOTHER WILL BE IMPOSSIBLE AND HUMANITY WILL FEEL THAT ITS PROGRESS HAS NOT SERVED. YOU, MY CHILDREN, DO NOT LOSE FAITH: WHAT MAN WILL NOT ACHIEVE, DIVINE OMNIPOTENCE WILL DO. I call you to pray for China before its power spills over humanity. Pray for Mexico, its soil trembles and My children suffer, and together with this country, the United States and Canada will be affected. Pray for My children of Jamaica, will be struck by nature. Puerto Rico will be tested again, not to the extent that men predict to alarm them. I invite you to pray for one another, you must not allow in you feelings contrary to the Love of God and man. Humanity will have to become aware that calling itself a Christian is more than a designation, it is Eternal Salvation when it is done and acts consciously within the Divine Law that calls all My children to be love in the midst of the calamities in which You will see the Church of My Son enveloped by the betrayals to which it has been subjected and those that will lead it to renew itself totally according to the Divine Will and not to that of men. From pain and persecution, the Church of My Son will go to find the door of Glory, totally surrendered to Divine Love, not the one they call at this moment: “love of God”. SOME SAY TO LOVE GOD AND VERY DIFFERENT IS THE DIVINE LOVE, WHICH IS THE FUSION OF MAN WITH HIS CREATOR. THE DIVINE WILL WILL TRIUMPH AND ALL THE CREATURES WILL LIVE IN IT AND PEACE WILL REIGN IN ALL MEN. THE KINGDOM OF GOD WILL TRIUMPH “SO ON THE EARTH AS IN HEAVEN” (Mt 6, 10b) AND MY CHILDREN WILL LIVE JOYFUL IN REAL TRUE LOVE. But now, My children, you must pray and act, for you have not been completely purified. The whitewashed tombs plot against My children, the learned feel the truth of God and before this take justice into their hands. Do not fear, children, that this Mother keeps you in constant alert and defense so that evil does not take you unawares. Beloved children, do not stop, Heaven anticipates the events so that they prepare themselves and go to God in humility. Do not despise this My Revelation, on the contrary, pray and act on behalf of your brothers. They will not continue living the same, learn to share fraternally, since they will live in community, to protect themselves from the evil that will possess a quantity of My children and for them My Heart bleeds. DO NOT BE OF THOSE WHO WAIT, BUT OF THOSE WHO COME TO THE DIVINE LOVE OF THE SACRED TRINITY, OFFERING THEIR SERVICE TO GOD BY THE TRIUMPH OF THE DIVINE WILL ON EARTH. My Love is before all My children, you are the ones who welcome or despise you. I call you in the name of My Son. My Blessing is for you. In this call our Blessed Mother alerts us with Her Love so that we prepare ourselves. Heaven desires of His children a spiritual preparation so that the strength of the Holy Spirit will keep us in the moments when the deception of evil circulates everywhere. Our Mother continues in the instruction so that we are aware that the practice of the Divine Mandates must be constant. We have to live in the world, but not be of the world, but be contemplatives, even if we live in the world, we are servants of God and we are called to fulfill what he commands. In the midst of the great crises that the human race is going through, our Mother calls us to continue standing, with a deep faith, discovering the Love of God for us in our daily lives. Brothers: let us live in continuous conversion, without getting tired and for this we take the Hand of the First Disciple of Christ: our Mother. After everything is did & done, some say we will a peasant lifestyle. What a “peasant lifestyle” exactly entails I’m not sure, but a simpler & modest lifestyle seems to be implied. Gosnell movie. I received an email from the Ann and Phelim regarding the soon to be released DVD’s. May I suggest one and all to help, pre-order the DVD’s and use as an evangalical tool? I pre-ordered ten and intend on getting more. We are preparing your GOSNELL DVDs and will be sending them out in February. This is the last chance to check and update your shipping address in your Indiegogo account, if you moved since your contribution. Thank you for all your support and your patience. We also wanted to bring you some other exciting news about the GOSNELL movie. They’re right. Last October, GOSNELL landed in the top 10 films at the box office and was the number one independent film in the United States during its opening weekend. Now it’s the #1 best-selling drama DVD on Amazon and #3 in all DVDs -and it won’t be released until February 5th! Here’s where we need your help. The film’s success has been overwhelming, but in the few days we’ve slipped in the Amazon Movie & TV rankings – we’re currently #13. Can you help us get into the top 10? It’s important that Hollywood-and the nation-hears this message. Pre-order your DVD today, and consider buying an extra copy or two for family and friends. It’s up to you to make sure this film is a success so more retailers will keep it in stock. After you’ve purchased your copy, please leave us a review on Amazon, hopefully you’ll agree with all the other reviewers and give us 5 stars..
We also wanted to let you know that the Susan B Anthony List has helped the GOSNELL movie since the very beginning. I met the President of the SBA List, Marjorie Dannenfelser when we started the Indiegogo campaign and she and her wonderful team have helped us all along this long journey to making this movie and getting it out across the country. On the opening day – SBA emptied their DC offices and the whole staff went to a screening. They are true friends of the GOSNELL movie and we wanted to thank them publicly, they are great, great supporters of the truth. and let’s make sure this story is finally known. Thanks for this information, Sean. The movie was shown in town for only one weekend and we missed it. I have pre-ordered the DVD. The ‘angry left’ will not go gently into the night. (ex.-Judge’s recent ruling nixing religious exemptions from contraception mandate.) Even if on their proverbial last leg, obstinacy prevents admitting ‘failure of their doctrines and policies’ or asking for help. But if and when they do reach out, everyone will need eagle wings to rise above the mire. Esp. if the US becomes a microcosm of Venezuela with sporadic operable utilities, runaway inflation and empty store shelves. It’s much easier to be kind and patient when one has a full stomach and is not freezing or sweltering. With Mother Mary’s grace, may we all be serene yet proactive as society deteriorates. Praying someone can evangelize Celine Dion, particularly, concerning her new line of gender neutral clothing which the exorcist Msgr John Esseff has warned is satanic. She has a such beautiful voice. Beckita, you practically took the words out of my mouth. The promo video for her clothing line is disturbing and in line with the antics of the cabal culture. Jen, That Caccini/Vavilov version of Ave Maria is perfect for pensive meditation; thanks for sharing! I can definitely say I’ve been aware of others viewing me through the eyes of Satan, especially when I bring up matters of God, faith & morality. Only God is good, if we remove God from government we end up with a society of tyrants, if we remove God from morality we end with a system that rewards sin & persecutes the just, and if remove God from science & history we end up with false knowledge based on ignorance and it is no better than fiction. It really is true that, once you remove God, everything goes to hell. So true. Charlie, so true. Something else that’s occurred to me, what is charity & mercy without God. This generation likes to throw money at problems, but when money replaces “the body of Christ” especially in secular charities, God’s love & spirit doesn’t reach people in the same way. Great insights AL. I am keeping you and Canada in prayer. I have thought a lot about words, namely CHOICE. Why does this word appeal to those and not ‘Freewill’? We all know one creature (in fact a lot) who chose once and their decision solidified faster than concrete in quicksand. I have wondered a lot about that too SeanSullivan17. Why would the Devil choose eternal separation from God if he knew for certain the consequences? How are we to understand such opposition and rebellion against God in beings endowed with such profound and enlightened intelligence? What can be the motive for such a radical and irreversible choice against God? Of a hatred so profound as to appear solely the fruit of folly? The Fathers of the Church and theologians do not hesitate to speak of a “blindness” produced by the overrating of the perfection of their own being, driven to the point of ignoring God’s supremacy, which requires instead an act of docile and obedient subjection. All this summed up concisely in the words: “I will not serve” Jer 2:20), which manifest the radical and irreversible refusal to take part in the building up of the kingdom of God in the created world. Satan, the rebellious spirit, wishes to have his own kingdom, not that of God, and he rises up as the first “adversary” of the Creator, the opponent of Providence, and antagonist of God’s loving wisdom. From Satan’s rebellion and sin, and likewise from that of man, we must conclude by accepting the wise experience of Scripture which states: “In pride there is ruin” (Tob 4:13). Another source says the fallen angels refusal to serve God instantly ‘fused’ thier nature towards evil. This fusion of evil is what makes them relentless in thier war against us and God. By thier very nature they are locked in evil and cannot do but evil forever. Interesting… By rejecting God the only light & truth, the fallen angels have no other good nor true opinions to turn to, as light & truth are absolutes. Fallen angels can’t turn back to God as the light is too painful to approach & their rejection of the only pure truth (especially God is perfect love) is comparable to a human’s constant rejection of God for their entire life. Charlie, thanks for this! With your posts and researching the Fathers, I’ve felt more reason to view others through God’s eyes than the alternate… I just finished my first go-through of St. Augustine’s 13 Confessions and have to admit that I am going through it again! Rich material, and to me it is amazing to see how he goes through infancy, through adulthood and how his love and realization of God in all things occurs. You talking about his last book and being fruitful was a point that when St. Augustine stated it, blew my mind…. his philosophical approach to setting up the 1-2 punch is so effective. Thank you, and I will continue to try to TNRS and be ASOH – especially during this year of Judgement… if I could get to a fraction of what St. Augustine writes about in his love and appreciation for God in all things, it would be an amazing step for me! I now pray for the conversion of all elected officials, my lukewarm family & friends, those who look at me through the satan’s eyes, and basically anyone I come in contact with by praying “O Blood and Water, which gushed forth from the Heart of Jesus as a fount of mercy for us, I trust in you.” It also reminds me daily on where my trust needs to reside and no where else! Archbishop Vigano is highly regarded by faithful prelates throughout this country and the world, Bob. These are men who have worked directly with him and vouch for his integrity and faithfulness to Mother Church. Yes in his letters when he references thoughts of facing God at judgment as motivation for his actions and he calls for McCarrick to do the same, he clearly has a view to the most important consideration in mind. Let us remember to pray for such men. All is corrupt! We need to start again…. In Love and obedience to the Father. So all has to fall. People are acting in fear, hurt and pain…… Survival rather than in Trust. I read your article Veronica….. A real one to make us all think. Sadly, I have experienced several priest who acted out of fear and allowed others to be hurt when they should have had courage to lead. Help us all Lord!! Be merciful to us all. A 2013 news article describes Cuomo’s hipocritical relationship with the Church. Furter now in 2019 he has doubled down on the same agenda. I ask all to contact, email, telephone their represntatives i.e. Bishops to EXCOMMUNICATE these ‘leaders’ of the free world. Charlie: seen tjhis article on the Federalist web page. Excellent article on abortion that i thought you might like (unless you have seen it already)…..
Hi all…can anyone put the changing of the catechism on the death penalty by Pope Francis into context with infallibility? Seems like it would be an infallible change, or teaching, as the catechism is a “sure norm” for teaching the faith…or was it wrong for two millenia? Thank you. Hi Gene. Doctrine can be refined and deepened, but it cannot contradict itself. Any effort to do so is invalid. I will leave it to the theologians to work out the details, but not even a Pope can decide that every Pope before him and every saint in history was actually ignorantly evil. Popes are not like politicians who each can come into office with their own unique agenda that may contradict every agenda that has come before. So yes, we have a problem that this Pope wants to adopt a “sure norm” that contradicts 2,000 years of sure norms. If it stood without being corrected, all it would do is destroy the reality that there can be sure norms. Sadly, I know some people who have left the Church for just this reason – one who is an opponent of the death penalty, itself. I say that this will be corrected soon enough, just as every other serious offense in history ultimately triggered a corrective to make sure that we men, who constitute Christ’s Church, get it right. It is a trial, but it will pass – and when it does through the efforts of good and holy men and women, we will be stronger and newer for it. A Pope is primary guardian of the Magisterium, not its Master. His job is to defend and protect what it is, not to mold it into what he wants it to be. Each Pope will have to account to God for how they guarded the Magisterium. If any one should try to overthrow Christ’s will for his own, he will face a terrible accounting – but the Church will then heal itself, just as it has so many times before. Fortunately, the story of Pope Francis in not entirely written yet, so who knows with certainty what he will be when his Papacy comes to a close. Could it also be that the Primary Guardian of the Papacy is the Magisterium whose job is etc? That won’t work, Joe. Scripture and Magisterium define the Papacy, including the extent and limitations of his authority. He does not define the Magisterium, though he can refine it if he does not try to contradict it. The Papacy is not the center of our faith; Christ is, as proclaimed by Scripture and the Magisterium. Happy Religious Freedom Day!! …. while that FREEDOM still exists!??! Mecca,Muslim’s holiest site is attacked by a plague of locusts! A snake washes ashore in St.Patrick’s Ireland! If evil can’t tempt you into the hateful judging of others, then evil will try to swing the temptations the other way so sin & immortality are ignored & allowed in others. The “don’t judge” passages in the Bible are in reference sinners seeking redemption, by acknowledging we are sinners too, and our job is to humbly help them out by not proudly thinking ourselves better. The anti-God left uses the “don’t judge” passages in the Bible (and ignores the rest), for a free pass to keep sinning all they want, telling others I’m morally good, as sin doesn’t exist; sin is a addiction, and addicts have a complex denial system to protect & justify their addictions. Good meditation, Al. It had me wondering, in general, whether I’m more apt to find myself confronted by difficult people or whether I do most of the confronting. Also, the notable (some think infamous) line from Pope Francis popped in my head: “Who am I to judge? Interesting that Jesus often posed questions as well, such as we see in Luke 12:13-14. “Man, who appointed me a judge…” Questions that were often rhetorical and challenging, but sometimes clearly to get some productive engagement without merely interrupting, lecturing, judging, pontificating… just good, effective communication skills that showed He cared. Was Jesus ever ambushed? II think of the most difficult people He dealt with (Pharisees, Sadducees…) and how He was never ruffled. Never scared or defensive. Also, He certainly wasn’t afraid to say, “no,” or even ignore. Finally, your thoughts had me contemplating how He was flexible. Maybe that’s not the perfect word that I’m trying to convey… I thought of nimble and some others, but the point is we see that interesting example in Matthew 15:21-28. “Woman, you have great faith. Your request is granted.” And her daughter was healed at that moment. This all helps me readjust moving forward, because I do indeed find myself confronting more than I care to admit. New focus: less confrontation, more real healing. Keep it up, Matt 7:7 “seek and you will find…”. I like to participate on this forum, as it helps me refine my thoughts & faith. A lot times I can build on others thoughts & information and even connect the dots to form a bigger & clearer picture. We don’t experience growth by being a island onto ourselves. After many years of extensive research and in depth study I have come to the conclusion that The Good Ship Lollipop and the Barque of Peter may be one and the same. 😂Joe! And just to sweeten the tone we can observe the modern trend to describe broken-up sheets of chocolate, etc as “bark”! Should it be “may NOT be one and the same”? For theirs is the kingdom of heaven. Yes, liberals are great advocates of spending other people’s money, and then rationalizing that they have elevated their own moral stature by such gutless, and irresponsible advocacy; the recent 60 Minutes broadcast of Ocasio-Cortez’s advocating a 70% tax bracket comes to mind ( I think the level of taxation increases to an 85% income tax take in NYC, home of Communist de Blasio). I do appreciate your posts! Our Brothers & Sisters in Christ desperately need our Prayers!!! A bunch from MILINET this morn. Speaking of GOOGLE, here are some background stories that you will never see on ABCNNBCBS-PBS/NYT/WashPo ……. It’s nothing less than criminal what Google and other “Social Media” sites get away with in regards to suppressing/distorting conservative entities & individuals. Yeah!! It’s still called The Department of Just-Us and we still have a blatantly two tiered “justice system” ;-( …. and Conservatives/Christians ain’t “Us” and the bottom tier is where we have been parked. I’m afraid it will take Revolution/CW II to fix it!! Crew Dog, just wanted to say a hearty “Thank you!” for your work at scouring the web to send us these informative links! I appreciate it so much! Please read this article by William Kirkpatrick in Crisis Magazine. It is one of the most frightening pieces I’ve read about the current world situation. The powers that are amassed against freedom of expression, especially when it involves discussions of Islam, are overwhelming. Not only are Facebook, Google, et al involved, but the major credit card companies (Visa, Mastercard) as well as PayPal refuse to process any payments to Robert Spenser, the founder of Jihad Watch. They also refuse to handle transactions for David Horowitz’s Freedom Center. (Horowitz, by the way, was a former “red-diaper” baby and 60s radical who became a conservative when he could no longer stomach the hypocrisy of the Left). “I don’t pretend to be able to interpret the Apocalypse, but that almost sounds like a fulfillment of Rev 13: 7—the passage which tells us that no one can buy or sell unless he has the mark of the beast. This kind of persecution has been building for a while, Frank. Your reference to the “mark of the beast” brought to mind a piece from the archives at TNRS, one published early on in the blog’s major posts, about the antichrist. It rang true for me that the spirit of antichrist is that with which we contend in these times. I just don’t think God would (edit here, removing the word “not”) allow us to be marked unwittingly. But I do think the “mark of the beast” could well be related to acceptance or rejection of the homosexual agenda… not only in being able to function in the world at large, but also in its role in the attempted destruction of our own Church. Dr. Kirkpatrick is not given to codes or conspircies. Nor is he into “Q’” or focuses on unapproved apparitions. He never definitiely said credit card giants were issing the mark of the beast. But something sinister is happening among the power elite. I think you missed his nuanced remarks. Sorry, but l’m writing this on a bus that’s taking me to the March for Life and typing is difficult. More on Sunday. No, Frank. I didn’t intend to give the impression that I thought Dr. Kirkpatrick was referring to any apparitions or conspiracies… but he did actually write: “I don’t pretend to be able to interpret the Apocalypse, but that almost sounds like a fulfillment of Rev 13:7—the passage which tells us that no one can buy or sell unless he has the mark of the beast.” And I do know there are many who are concerned about the “mark of the beast” so I referenced Charlie’s words as apropos thoughts for considering what the mark might be. God bless your journey and activities as you march. Charlie is not the first to say the “mark” is an ideal. It has been said that how we think (head) and what we do (hand) are the actions of sin. (Matt 15:19) contends evil comes from within a person and one cannot be defiled from the outside but must embrace evil in the heart. So this “Mark” is a sign of one’s interior disposition and not something forced upon someone even if a supposed agreement to use such a device (Mark) is made as a way to “buy and sell” since using it in a normal just way does not occasion a sin. But, if a PC “Mark” we’re used to control those who buy or sell, this “Mark” or ideal would be a form of surrender to evil, whether by desire, force or coercion since once one agrees to capitulate with evil, they too become it’s author. An aside today at Mass on the feast of St Anthony the Abbot. was read portions from Ephesians 6, but the description of the full armor of God was omitted in the readings. The omissions in the lectionary are sometimes quite irritating to me. Are they trying to make us spiritual wimps but not teaching about the Full Armor? ❤️❤️❤️ Blessed Solanus Casey and Fr. John Riccardo. So apropos to what we’re about here as we’re a just bunch of God’s kids walking around in adult bodies. Thanks for this, Joyful. I posted a heartfelt plea for your kind prayer for a situation which had presented itself in my family. it seemed to self destroy. I beg your prayers for my family situation. So sorry to hear of this trial, Julia. Prayers ascending for you and your family. I’m praying for your family situation, Julia. May all be well. Julia, I hold you and all families experiencing difficulties in these most trying times. Prayers for you and your family, Julia. Julia, I just now saw your prayer request. I will keep you and your intentions in my prayers.